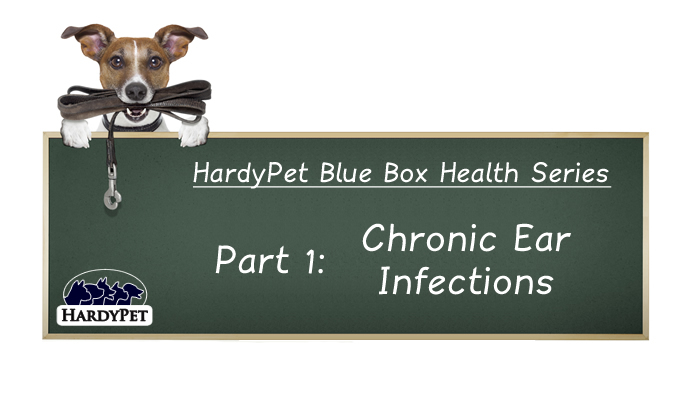 This article is part of the ten part HardyPet Blue Box Health Series which is dedicated to providing educational information to dog owners about common canine health conditions, their causes, and the natural solutions available. The overall goal of this education initiative is to improve the overall health of our canine population and reduce rescue shelter populations worldwide. Health problems which are perceived to be too expensive or difficult to treat are the most common reason for owner-surrenders to shelters. Please join us in this initiate buy support canine health and your local rescue shelter/organization. Chronic ear infections, or otitis, is a long-lasting ear infection which can affect any dog, causing itchy, painful ears with a distinct odor. There are a number of possible causes for the disease — parasites, allergies, growths — which if allowed to progress can lead to a rupturing of the eardrum or narrowing of the ear canal. Treatments can include cleaning, antimicrobials, anti-inflammatory medications, and in some cases surgery. This serious condition is growing more common each year and can often be prevented with a deeper focus on the nutritional needs of your dog. 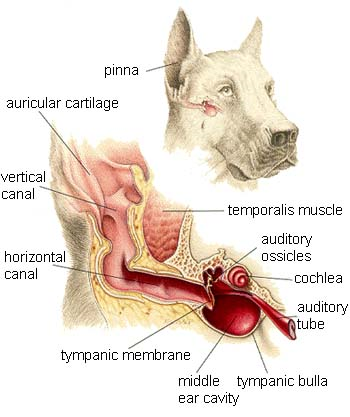 Chronic otitis is a common disease of a dog's ear canal. Otitis can be externa (of the outer ear canal alone), media (involving the middle ear), or interna (involving the inner ear and associated structures). Unlike the typical ear infections humans suffer (children, especially) in which the middle ear is typically affected, this disease is one that affects the external ear canal primarily and the middle and inner ear secondarily. As such, this disease in dogs is categorized as a dermatologic (skin-related) condition. The typical disease process follows a common progression: 1) Irritation to the skin lining the ear canal causes inflammation, which results in excess wax production and a comfortable environment for yeast and bacteria (normal residents of the ear canal) to overgrow. 2) These microbes cause significant itchiness and more inflammation, which leads to an itch-scratch cycle conducive to self-trauma via headshaking, pawing, and rubbing of the ears. Any dog can develop an ear infection regardless of ear shape, exposure to water (swimming), or the amount of hair inside the ear canal. That’s because the underlying cause of the irritation that initiates the disease process is typically allergic or otherwise unrelated to conformation and moisture. Environmental allergies (atopy) and food allergies can cause allergic skin disease, which is a common reason for otitis externa. Allergic skin disease may also be influenced by the presence of thyroid disease or adrenal gland disease (Cushing’s disease). Candida yeast overgrowth can mimic symptoms of skin allergies and is a known contributing factor to chronic ear infections. The most severely affected patients often get stuck in a cycle of inflammation, infection, and thickening of the tissues lining the ear canal (fibrosis), which eventually leads to narrowing of the ear canals, ruptured eardrums, and debris and infection within the middle ear — a highly painful process, to be sure. Over time, scar tissue occludes the canals, preventing medications from reaching the diseased portions of the canal. The occluded canals also prevent the natural sloughing of the canal’s skin cells, sebum (wax), and hair, which accumulates in both the canal and middle ear, thereby intensifying the infection. Considering the long-term nature of this condition, chronic otitis is a frustrating disease for both owners and veterinarians. But for patients, the disease is much more critical, given that they typically suffer significant pain. The pain — not to mention the nagging itchiness — associated with these ear infections makes our frustration seem petty in comparison. Affected dogs typically experience recurrent bouts of malodorous discharge, moderate pain, and substantial itchiness. But a significant subset will suffer these symptoms on a constant basis with no relief. Some pets may even try to bite someone who attempts to touch their ears or head. Some dogs with severe otitis may cry or groan as they rub and scratch their ears. Others will scratch so severely that their nails create wounds on the skin around their face, neck, and ears. If the otitis is severe or chronic, the outer ear canal can begin to thicken and become deformed. This thickening can make the ear opening very narrow, so cleaning the ears becomes more difficult. Ulcerations on the inside of the ear canal can also result from infection and self-trauma. As mentioned above, chronic otitis that begins in the outer ear canal can ultimately rupture the eardrum, ending in otitis media and otitis interna. Progression of this infection into the middle and inner ear can be associated with even more severe clinical signs, including development of a head tilt, incoordination, inability to stand or walk, hearing loss, and severe, unrelenting pain. A medical history and physical examination findings can provide valuable information for your veterinarian when trying to diagnose an ear infection. The medical history may include trying to determine how long the ear infection has been going on, whether it has occurred before and whether any other signs of illness have been observed. Physical examination findings may reveal evidence of underlying illness, such as thyroid disease and Cushing’s disease. * Cleansing the ear canal is always recommended to clear accumulated debris. If the otitis is painful and/or an extensive process, cleansing should ideally be undertaken with the pet under sedation or anesthesia. Otoscopy is often recommended as an aid in this process. * Topical medication tailored to treat the specific bacteria, yeast, or mites present is typically used (these are usually available as either ear drops or ointments). These include antibiotics, antifungals (to kill yeast), anti-inflammatory drugs (like cortisone), and topical anesthetics. * Systemic antimicrobials (antibiotic given by mouth or injection) are indicated in some cases, such as if the eardrum is ruptured. Ideally, antibiotic therapy is based on the results of culture and sensitivity testing. * Systemic anti-inflammatory medications, such as corticosteroids, are sometimes employed to reduce the pain, redness, and swelling. Antihistamines may also be prescribed. It is important to note that treatment of the symptoms without addressing the underlying cause will only provide a dog with temporary relief. Identifying and removing the source of the problem will eliminate chronic ear infections and make for a much happier dog and owner. The only way to stop the occurrence and reoccurrence of chronic ear infections is to attack the source of the problem and take a few easy steps to help your dog fight the disease early on. ~ Routine cleaning of the ear canal will help eliminate debris that can foster yeast growth. ~ Since the majority of chronic ear infections are related to skin allergies, and the majority of skin allergies are related to the food a dog eats every day, it is important to only use a food which is known not to cause allergies. With so many foods to choose from this can be difficult. There are three important areas to focus on: 1) use only a true grain free food, 2) try an food that uses a seafood based protein source, and 3) eliminate everything else from your dog's diet (including treats, table scraps, edible toys, etc). This will allow your dog's immune system to relax and should provide a positive contribution to their chronic otitis. ~ Introduce a daily multivitamin like HardyPet Skin&Coat. The 42 ingredients contained in this formula include natural anti-inflammatories, allergy fighting compounds, and support for proper immune system function. Having the right nutrition makes every body system work better individually and as a whole. ~ Give your dog a daily canine specific probiotic to fight candida yeast overgrowth. There is an ongoing battle in the digestive tract of every dog between yeast and good bacteria (flora). The winner of this fight determines the health of your dog and how well they use nutrients in the digestive tract. Whenever good bacteria populations are compromised, candida yeast populations increase and cause a number of problems including skin allergies that can affect their ears. By using a true Canine-Specific probiotic like HardyPet PRO6, the natural flora populations get daily reinforcements to fight the battle for your dog's health. Only strains of good bacteria that are native to your dog's system, like those in PRO6, will provide any benefit. Chronic ear infections are one of the more common and difficult problems dogs and their owners face. It is persistent, can rapidly worsen if left untreated, and will cause serious damage if not reversed in time. The best treatment for chronic ear infections is for owners to take the steps necessary to make sure their dogs never acquire the disease. The right diet and proper nutrients can make sure your dog never suffers again. The information in this article does not constitute medical advice; canine medical advice is the purview of veterinarians. Instead, this article is educational material, written to provide you, the reader, with information, to inspire you to learn more, and to empower you to make decisions about your dog's wellbeing. For medical advice, consult your veterinarian and get a second opinion if needed. For fuller empowerment, read, study, and notice as much as you can so that you can make decisions from a position of knowledge.